In 2010, the Convention on Biological Diversity adopted a revised and updated Strategic Plan for Biodiversity, including the Aichi Biodiversity Targets. Aichi Target 11, to effectively protect and manage 10% of global coastal and marine areas, is currently not on course to be achieved by the 2020 deadline. The percentage that is presently safeguarded as Marine Protected Areas in Europe is not effectively managed. This means that while areas are designated as protected, this protection is neither well enforced nor effectively monitored. Marine protection must be well implemented to ensure their success in preserving ocean health and resilience. The EPO, with the support of WWF’s national and regional offices, is advocating and intervening at the EU level to hold both the Commission and Member States accountable for promoting and coherently delivering on ecosystem-based marine and biodiversity policy targets, including Aichi Target 11 and the achievement of good environmental status (GES) for all EU waters by 2020. This work involves sharing best practices and lessons learned from high performing national, European and global plans that already exist, while providing guidelines to improve where needed. Our vision is that marine activities in all European waters will be guided by ecosystem-based Marine Spatial Plans (MSP) that are well integrated with other marine policies by 2021, to bring together all relevant sectors for sustainable management of the marine environment. Currently, the roles of environmental protection and European fisheries are largely left out of MSP discussions, resulting in plans that are lacking in holistic and sustainable approaches for effective marine management. Important components of marine ecosystems must be safeguarded both inside and outside an ecologically coherent and well-managed network of Marine Protected Areas (MPA). As the safety net of Europe’s marine ecosystems, this network of MPAs must cover at least 10% of Europe’s marine environment by 2020, with a path to 30% effective protection by 2030. Work in this sector is of paramount importance to achieve the EU’s objective of good environmental status of Europe’s marine waters by 2020. European seas that are thriving and full of life are those guided by ecosystem-based MSPs and that contribute to a sustainable Blue Economy in which critical marine habitats are properly protected through MPA networks. 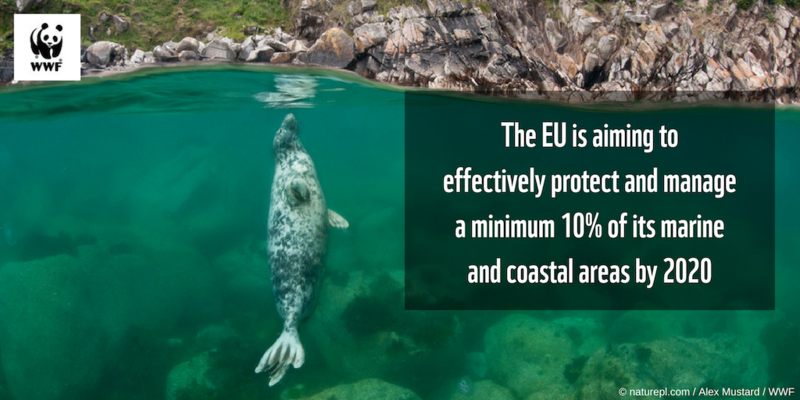 Action is required from the EU institutions to deliver across the spectrum, from national MSPs that are ecosystem-based, down to co-management of local MPAs. “The environmental status of marine waters where these provide ecologically diverse and dynamic oceans and seas which are clean, healthy and productive” Article 3, Marine Strategic Framework Directive. Marine Spatial Planning (MSP) brings multiple stakeholders together, including energy, industry, government, conservation and recreation, to make informed and coordinated decisions about how to use marine resources sustainably. Marine Protected Areas (MPAs) aim to manage human activity within a specific area to protect the habitats, species and ecological processes to keep or restore them back to their natural state. Ecosystem-based management emphasises connectivity within and between systems, such as between land and sea, focuses on the consequences of human actions within ecosystems, encourages the protection and restoration of ecosystem structure, function and key processes, and integrates biological, socioeconomic and governance perspectives. United Nations Sustainable Development Goal 14 (SDG14) aims to “Conserve and sustainably use the oceans, seas and marine resources for sustainable development”.